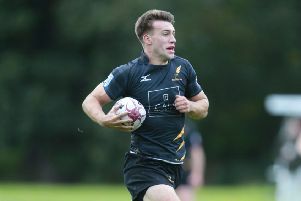 Winger Ben Robbins bagged five tries as Currie Chieftains defeated Hawick at Malleny Park. The match took a while to burst into life, Currie having the majority of the possession in the opening half hour, but the game remained scoreless. Hawick did take the lead eight minutes before the break, a good forward drive seeing Edinburgh Rugby’s Italian prop Pietro Ceccarelli being the man credited with the score. Stand-off Kyle Brunton converted and it was 7-0 to the visitors. Currie reacted well to going behind and they levelled things in the 39th minute. A break from their own half saw full-back Jamie Forbes set up Robbins for the try. Stand-off Gregor Hunter converted to make it 7-7 at the interval. A converted try by back-row Thomas Gordon three minutes into the second half made it 14-7. 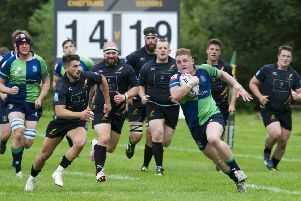 And, in the 54th minute, a deadly break by centre Joe Reynolds from his own try line eventually set-up Scotland Sevens man Robbins for his second try of the day. Hunter duly converted and the score was 21-7. Robbins completed his hat-trick in the 70th minute and scored his fourth in the 77th minute, both converted by Hunter. A fifth converted effort came from Robbins to finish things in style.